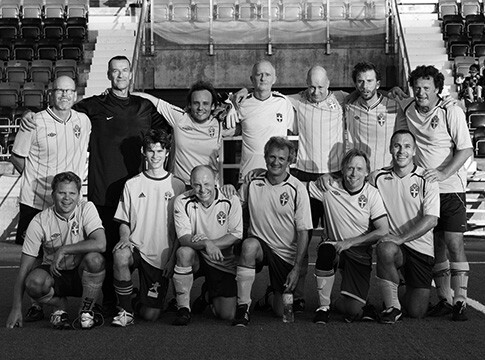 Since 2005, the Swedish Authors Football Team, a team consisting of fiction writers, poets and some academics, have played games against similar teams from England, Germany, Italy, Norway, Denmark and other countries. 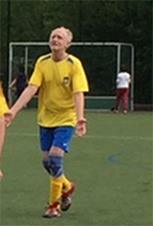 Games have also been played against the Swedish Doctors Football Team, for instance. There is a cultural aspect to these games: The matches are followed by readings in pubs or restaurants, and the players from the different teams get to know each other in informal settings. The team also try to get involved in other events with relevance for football and culture (photo below: Lars Eklund). One such example is the collaboration with Östersunds FK, a team playing in “Superettan”, the second-highest dvision within the Swedish football system. When they reached that division, together with Magnus Sjöholm, the goalkeeper and manager of the Swedish Authors Football Team, the chairman of Östersunds FK arranged for a one day workshop when the writers met with players and team staff in order to talk about writing. The idea was to produce an anthology in which all of the players and the whole staff wrote about their experiences related to winding up in Östersund and playing for Östersunds FK. The specific interest in producing such a book is that Östersund has gathered a truly international team: the coach, Graham Potter has played for Southampton in the Premier League, and presently out of the 24 players in the squad, ten are born outside of Sweden (Ghana, Nigeria, South Korea, Mexico, etc). And despite some hesitation about going outside one’s comfort zone, the experiment was sucessful: the year after the workshop, Min resa till ÖFK (My Journey to ÖFK) was published by Modernista, one of Sweden’s leading – and most influential – book publishers. But enough of small talk. It is still about football. And winning! 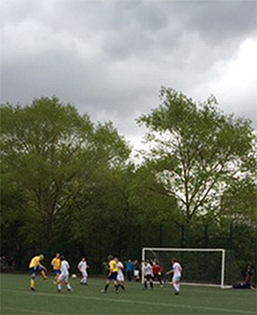 On May 9, on a rainy day in London, at Paddington Recreational Ground we met the England Writers Team in a friendly. England had never beaten Sweden before and was thus heavily motivated. They also managed to get two quick goals, one by having a shot from long distance change direction via a deflection off a Swedish defender, then a second when the (English) referee found a penalty kick in a situation which for us did not look like a penalty at all. We did manage to get back into the game. I had a shot saved on the goal line by the mighty England keeper (since this is my blog I get to choose which parts of the game to focus on), but after that two beautiful goals – one header and one distinct shot – made the game even. We were close to getting our third goal when one more England shot was deflected into goal by one of our defenders. 2-3, and even though the ball balanced on the English goal line the last seconds of the game, England held on for victory. So a historic loss. But food and moving readings from players of both teams at the nearby pub The Squirrel made it all worthwile. There will be more games.